The Utah Jazz are an American professional basketball team based in Salt Lake City, Utah. The Jazz compete in the National Basketball Association (NBA) as a member club of the league's Western Conference, Northwest Division. Since 1991, the team has played its home games at Vivint Smart Home Arena. The franchise began play as an expansion team in 1974 as the New Orleans Jazz (as a tribute to New Orleans' history of originating Jazz music). The Jazz moved to Salt Lake City in 1979. The Jazz were one of the least successful teams in the league in their early years. Although 10 seasons elapsed before the Jazz qualified for their first playoff appearance in 1984, they did not miss the playoffs again until 2004. During the late 1980s, John Stockton and Karl Malone arose as the franchise players for the team, and formed one of the most famed point guard–power forward duos in NBA history. Led by coach Jerry Sloan, who took over from Frank Layden in 1988, they became one of the powerhouse teams of the 1990s, culminating in two NBA Finals appearances in 1997 and 1998, where they lost both times to the Chicago Bulls, led by Michael Jordan. Both Stockton and Malone moved on in 2003. After missing the playoffs for three consecutive seasons the Jazz returned to prominence under the on-court leadership of point guard Deron Williams. However, partway through the 2010–11 season, the Jazz began restructuring after Sloan's retirement and Williams' trade to the New Jersey Nets. Quin Snyder was hired as head coach in June 2014. On June 7, 1974, the New Orleans Jazz were admitted as an expansion franchise into the National Basketball Association (NBA). Team officials selected the name because of its definition in the dictionary: collective improvisation. The team began its inaugural season in New Orleans in the 1974–75 season. The team's first major move was to trade for star player Pete Maravich (who had played college basketball at LSU) from the Atlanta Hawks for two first-round draft picks, three second-round picks, and one third-round pick over the next three years. Although he was considered one of the most entertaining players in the league and won the scoring championship for the 1976-77 season with 31.1 points per game, the Jazz's best record while in New Orleans was 39–43 in the 1977–78 season. Maravich struggled with knee injuries from that season onward. Venue issues were a continual problem for the team while it was based in New Orleans. In the Jazz's first season, they played in the Municipal Auditorium and Loyola Field House, where the basketball court was raised so high that the NBA Players Association made the team put a net around the court to prevent players from falling off of the court and into the stands. Later, the Jazz played games in the cavernous Louisiana Superdome, but things were no better, because of high demand for the stadium, onerous lease terms, and Maravich's constant knee problems. They also faced the prospect of spending a whole month on the road each year because of New Orleans' Mardi Gras festivities, similar to the long road trip faced by the San Antonio Spurs each season during their city's rodeo. Years later, founding owner Sam Battistone claimed that there was no contingency plan in case the Jazz had ever qualified for the playoffs. However, the Superdome's manager at the time, Bill Curl, said that the stadium's management always submitted a list of potential playoff dates to the Jazz management, but these letters were never answered. After what turned out to be their final season in New Orleans, the Jazz were dealt a further humiliation when the Los Angeles Lakers selected Magic Johnson with the first overall pick in the 1979 NBA draft. The pick would have been the Jazz's had they not traded it to acquire Gail Goodrich two years earlier. Also, the Jazz had given up the rights to Moses Malone in order to regain one of the three first-round picks used for the Goodrich trade; the combination of Johnson and Malone blossoming into Hall of Famers and Goodrich's ineffective, injury-ruined few years in New Orleans made this transaction one of the most lopsided in NBA history. Despite being barely competitive, the Jazz drew well during their first five years. However, by 1979 the franchise was sinking financially. Barry Mendelson, the team's executive vice president for most of the early years, said one factor in the financial trouble was an 11-percent amusement tax, highest in the U.S. at the time. The team also could not attract much local corporate support—an important factor even in those days—or local investors. Battistone concluded that the franchise would not be viable in New Orleans and decided to move it. After scouting several new homes, he decided on Salt Lake City, even though it was a smaller market. Salt Lake City had previously been home to the Utah Stars of the American Basketball Association (ABA) from 1970 to 1976. The Stars had been extremely popular in the city and had even won an ABA title in their first season after moving from Los Angeles. However, their finances collapsed in their last two seasons, and they were shut down by the league 16 games into the 1975–76 season after missing payroll. Although Salt Lake City was not known for its jazz culture, the team decided to keep the name, as there was not enough time before the start of the 1979–80 season to receive league approval for a name change. The Jazz also preserved the original Mardi Gras-themed colors: green, purple, and gold. The Jazz's attendance declined slightly after the team's move from New Orleans to Utah, partly because of a late approval for the move (June 1979) and also poor marketing in the Salt Lake City area. The team's management made the first of several moves in 1979, bringing high-scoring forward Adrian Dantley to Utah in exchange for Spencer Haywood. Dantley averaged 28 points per game during the 1979–80 season, allowing the team to waive Pete Maravich early in the year. The team struggled to a 24–58 mark, but was rewarded with the second overall pick in the 1980 NBA draft, which they used to pick Darrell Griffith of Louisville, another piece of the rebuilding puzzle. During the 1980–81 NBA season, the Jazz struggled financially as well as on the court. Despite having perennial All-Star Dantley, 20-point-per-game scorer and Rookie of the Year Griffith and emerging point guard Rickey Green, the Jazz were still unable to get above .500, finishing 25–57. 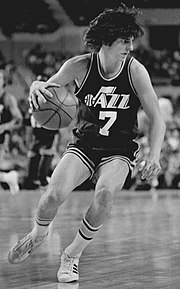 Tom Nissalke departed as coach after the Jazz started the 1981–82 season 8–12, and general manager Frank Layden replaced him. Layden's coaching was not an improvement early on, as the Jazz went 17–45 the rest of that season to finish 25–57. The 1982 NBA draft saw the Jazz pick Georgia's Dominique Wilkins, though the team would have preferred either James Worthy or Terry Cummings, but those players went 1–2 to the Lakers and Clippers respectively. Utah had been confident that the Lakers would take Wilkins, which would have given them a shot at either of the other top forwards (they favored Cummings over Worthy because Cummings had shown he could play both small and power forward). However, Utah was not aware that the Lakers had researched both Worthy and Wilkins and decided on Worthy out of concern about Wilkins' perceived selfishness. Battistone's continued financial problems, combined with Wilkins making it clear he did not want to play in Utah, resulted in the Jazz sending Wilkins to Atlanta in return for John Drew and Freeman Williams. This trade, even considering the circumstances, turned out to be one of the worst in NBA history. Wilkins would go on to a Hall of Fame career, while Drew and Williams would only play a combined four seasons with the Jazz. In the 1982–83 season, leading scorer Dantley missed 60 of 82 games and newcomer Drew also missed time, playing in only 44 games. The Jazz ended up being led by Griffith (22.2 points per game), Green (14.3 points per game) and Danny Schayes (12.4 points per game). A rookie 7'4" center, Mark Eaton, manned the post. The team finished 30–52, still out of the playoffs, but an improvement over recent years. During the 1983 NBA draft, the Jazz used their first-round pick, seventh overall, to choose Thurl Bailey, and later took Bob Hansen in the third round, 54th overall. 1983–84 opened as a season of uncertainty. The team was losing money, and management was crafting stunts, such as playing games at the Thomas & Mack Center in Las Vegas, to help the team become more profitable. The team was rumored to be moving as a result of Battistone's cash shortage as well as the fact they were playing in the league's smallest market. However, fortunes on the court improved, with a healthy Dantley, Jeff Wilkins, and rookie Bailey at the forward positions, Eaton and Rich Kelley jointly manning the post, Green and Griffith at the guards, and Drew adding 17 points per game off the bench. They went 45–37 and won the Midwest Division, the first winning season and division championship in team history. The Jazz advanced to the playoffs, defeating the Denver Nuggets 3–2 in the first round, and moving on to play the Phoenix Suns in the second round. Despite having home court advantage in the best-of-seven series, the Jazz lost to the more experienced Suns, 4–2. Jazz fans were not happy when the team picked an unknown guard in the first round of the 1984 NBA draft, John Stockton. The Jazz fans on hand for the draft party booed the selection. The 1984–85 season saw the emergence of Mark Eaton as a defensive force. Eaton averaged 5.56 blocks per game (still an NBA single-season record) along with 9.7 points and 11.3 rebounds, and won the NBA Defensive Player of the Year Award. On the downside, John Drew played only 19 games all season, which deprived the team of their high-scoring sixth man. But the Jazz returned to the playoffs, facing the Houston Rockets and their All-Star centers, Hakeem Olajuwon and Ralph Sampson. The Jazz prevailed in the series, 3–2, and advanced to the second round, losing the series to the high-scoring Denver Nuggets, 4–1. The team's perennial financial woes and instability were somewhat stabilized during April 1985, when auto dealer Larry H. Miller bought 50 percent of the team from Battistone for $8 million. Battistone had been seeking to move the team. In the 1985 NBA draft, the team added Louisiana Tech power forward Karl Malone, who made an immediate impact in the 1985–86 season, averaging 14.9 points and 8.9 rebounds per game. However, starter Darrell Griffith missed the season with a stress fracture, and the Jazz hovered around .500 most of the year. In postseason, the Jazz lost in the first round to the Dallas Mavericks, 3–1. During the 1986 off-season, Battistone was approached to sell the team to Marv Wolfenson and Harvey Ratner, who would have moved the team to Minneapolis. Larry Miller did not want to sell the team, but because of contractual language in his agreement with Battistone, could have been bought out by the new owners if he had refused to sell. Offers went as high as $28 million (the Jazz were valued at $16 million less than a year earlier when Miller purchased half for $8 million) before Miller stepped in at the last minute, purchasing Battistone's remaining 50 percent for $14 million and keeping the team in Utah. Wolfenson and Ratner later became the founders of the Minnesota Timberwolves expansion franchise which, coincidentally, was almost sold and moved to New Orleans in 1994. The 1986–87 season was one of change. Adrian Dantley, the team's star player who had carried them through the early years in Utah, was traded to Detroit for Kelly Tripucka, who ended up splitting time with Thurl Bailey. Darrell Griffith, back from injuries that caused him to miss the 1985–86 season, lost his starter spot at guard to Bob Hansen. Stockton warranted more time at the point guard position. Despite all these changes, the team finished 44–38 before losing to the Golden State Warriors in the first round of the playoffs. For the 1987–88 season, Stockton took over for Rickey Green as the starting point guard, and Malone established himself as one of the better power forwards in the league. The team finished 47–35 and defeated Portland, 3–1, in the first round, earning a second-round matchup with the reigning NBA champions, the Los Angeles Lakers. After Los Angeles took Game 1 at home, the Jazz won Game 2 in Los Angeles, 101–97, and took the lead in the series 2–1 with a Game 3 win in Salt Lake City. The Jazz lost Games 4 and 5, but won Game 6, 108–80, tying the series 3–3. In the decisive Game 7, the Lakers won 109–98. During the 1988–89 season, Frank Layden stepped down as head coach of the Jazz after the first 17 games, and was replaced by Jerry Sloan. The Jazz won 51 games and the Midwest Division championship as they grew better overall. Malone and Stockton, as well as Mark Eaton, were the leaders of the team and also All-Star selections. Eaton won Defensive Player of the Year for the second time, and it appeared the Jazz were ready to take the next step toward contending for an NBA title, after having pushed the Lakers to seven games in the Western Conference semifinals the previous season. However, the second-seeded Jazz were eliminated in the first round in three games by the seventh-seeded Golden State Warriors. The following year, 1989–90, the Jazz made some changes. Thurl Bailey, who was relied on for 19 points per game the previous season, saw his playing time reduced in favor of rookie Blue Edwards, who played a prominent role with the team. The result was the best win-loss mark in team history, as the Jazz finished 55–27, second in the division to the San Antonio Spurs (56–26). Malone had his best season statistically, averaging 31.0 points and 11.1 rebounds. Stockton averaged 17.2 points and 14.5 assists per game, both career highs, with the assist total and average leading the NBA that season. In the playoffs, the Jazz played the Phoenix Suns in the first round, led by All-Stars Tom Chambers and Kevin Johnson. The Suns defeated the Jazz 3 games to 2. Again, the Jazz were left with questions as to how they could do so well in the regular season but fail to advance in the playoffs. For the 1990–91 season, the Jazz made another move to improve the team by executing a three-way trade that brought shooting guard Jeff Malone to Utah from the Washington Bullets, while Eric Leckner and Bob Hansen were sent from Utah to the Sacramento Kings and Pervis Ellison going from Sacramento to Washington. The Jazz began the season 22–15 before going 27–8 in January and February, with new addition Jeff Malone averaging 18.6 points, giving them three strong scoring options (Karl Malone, Jeff Malone, and John Stockton – 64.8 of the team's 104 points per game). The Jazz finished 54–28, second in the division to San Antonio by a game, similar to their division finish the prior year. In the playoffs, they met the Phoenix Suns for the second year in a row. Game 1 was a blowout Utah win, in Phoenix, 129–90, which set the tone for the series, as Utah eliminated the Suns 3–1, earning a second round matchup with the Portland Trail Blazers, the defending Western Conference champions. The Jazz played well, keeping close in most of the games, but lost the series 4–1 to a deeper and more experienced Trail Blazers team. The 1991–92 season proved to be the most successful in team history to that time. The Jazz moved to the Delta Center, a state-of-the art arena that featured a seating capacity of 19,911. The new venue was a considerable improvement over the Salt Palace, which seated just over 12,000 and lacked luxury suites and retail space. Early in the year, a trade brought Tyrone Corbin, a tough defensive forward, from Minnesota in exchange for fan-favorite Thurl Bailey. The Jazz went 55–27 and won the Midwest Division championship for the first time since 1989. In the playoffs, the Jazz defeated the Los Angeles Clippers 3–2 in the first round, then beat the Seattle SuperSonics in the second round, 4–1, to advance to the Western Conference Finals for the first time, where they again faced and lost to Portland, this time 4–2. The 1992–93 season was a letdown, as the team slumped to 47–35 and third place in the division. The center position, manned by Mark Eaton for most of the past decade, became suspect as he struggled with injuries and age. The bright spot was the hosting of the NBA All-Star Game and the surrounding events of All-Star Weekend. In the playoffs, the Jazz lost to Seattle in the first round, 3–2. During the postseason, the team addressed the center position by acquiring Felton Spencer from Minnesota in return for backup center Mike Brown. During the 1993–94 season, the Jazz traded Jeff Malone to the Philadelphia 76ers for shooting guard Jeff Hornacek. Hornacek meshed well with Stockton, and the Jazz improved to 53–29. In the playoffs, they faced San Antonio in the first round, shutting down NBA scoring leader David Robinson in the series. Robinson had averaged 29.8 points on 50 percent shooting during the regular season, numbers that dropped to 20.0 and 41 percent in the series against Utah. The Jazz then fought off a determined Denver Nuggets team 4–3 in the Conference semifinals (almost blowing a 3–0 series lead in the process) to advance to the Western Conference Finals, where they lost to the eventual NBA champion Houston Rockets 4–1. In the 1994–95 season, the Jazz had significant depth and talent and were expected to make a serious run for the championship. However, they lost starter Spencer 34 games into the season with a ruptured Achilles tendon. Despite this setback, the Jazz finished 60–22 before again losing to Houston in the playoffs, 3–2, in the first round. Greg Ostertag was added to the team for the 1995–96 season. The Jazz went 55–27, and reached the Conference Finals for the third time in history, nearly overcoming 3–1 series deficit before eventually succumbing to Seattle, 4–3. In the next two seasons, the Jazz were finally able to capitalize on regular season success. In 1996–97, the Jazz had the best record in franchise history (64–18), won the Midwest Division and finished with the best record in the Western Conference. The team included Stockton, Malone and Hornacek, as well as Bryon Russell, Antoine Carr, Howard Eisley and Shandon Anderson. Malone won his first NBA MVP award, averaging 27.4 points, 9.9 rebounds and 4.5 assists per game. The Jazz reached the NBA Finals for the first time after beating the Clippers 3–0, Lakers 4–1 and Rockets 4–2. The Jazz then met Michael Jordan and the Chicago Bulls in the Finals, losing the series 4–2, with the last two games decided in the final seconds (scores of 90–88 and 90–86). During the off-season, the Jazz made no changes to the roster. As the 1997–98 season neared, they were expected to be contenders for the championship again. However, Stockton suffered a serious knee injury before the season, and missed the first 18 games, in which the Jazz went 11–7. Once he returned, the team went 51–13, to finish at 62–20, and won the Midwest Division and home-court advantage for the playoffs. In the playoffs, the Jazz beat Houston 3–2, and San Antonio 4–1, to advance to the Western Conference Finals for the third straight year. Utah, with a veteran roster of Stockton, Malone and Hornacek, faced a Los Angeles Lakers team led by superstar Shaquille O'Neal, guards Eddie Jones, Nick Van Exel and a young Kobe Bryant. The Jazz set the tone for the series with a win in Game 1, 112–77. Game 2, a 99–95 Jazz victory, and Games 3 and 4 in Los Angeles were decided by an average of 7.5 points. The Jazz swept the Lakers and earned a second consecutive trip to the NBA Finals. In the 1998 NBA Finals (again against the Chicago Bulls), the Jazz took Game 1 at home, 88–85 in overtime. However, the Bulls overcame a slow start to win Game 2, 93–88, easily took Game 3, 96–54, and won Game 4, 86–82, to lead the series 3–1. The Jazz fought back and won Game 5 on the road, 83–81, to trail 3–2 in the series, with Game 6 (and a Game 7 if needed) in Salt Lake City. The Jazz held a lead in most of Game 6, but the Bulls rallied, and in the last seconds of the game, Michael Jordan stole the ball from Malone on the final Jazz possession and then made a famous jump shot to win the game, 87–86, and the series for Chicago, 4–2. In the 1999 season, shortened to 50 games due to a lockout, the Jazz finished 37–13, tied with the Spurs for the best record in the league. They defeated the Sacramento Kings in five games in the first round of the playoffs. However, they lost in the second round of the playoffs to the Portland Trail Blazers. Despite yet another disappointment, Malone was awarded his second MVP. During the 1999–2000 season, the Jazz finished 55–27 and won the Midwest Division but again struggled in the postseason, and lost to the Portland Trail Blazers in the second round. In the off-season, Hornacek retired and Howard Eisley was traded in a four-team deal that brought in Donyell Marshall. They selected promising high school basketball star DeShawn Stevenson in the first round of the 2000 NBA draft. In the 2000–01 season, they went 53–29, but they lost in the playoffs, surrendering a 2–0 series lead in the first round of the playoffs to the Dallas Mavericks, to lose the series 3–2, their earliest exit from the playoffs since the 1994–95 season. In the 2001–02 season, Andrei Kirilenko made his rookie debut, averaging 10.7 points, 4.9 rebounds, and 1.91 blocks per game. The team started slowly, 16–15 over the first two months, and finished 12–13 to go 44–38 overall. They lost to the Sacramento Kings 3–1 in the first round of the playoffs. Prior to the 2002–03 season, Marshall and Russell moved on to other teams. Matt Harpring was brought over from the Philadelphia 76ers. He took over the starting forward spot next to Malone and averaged 17.6 points and 6.6 rebounds, the best numbers of his career. The Jazz approached 50 wins going into the playoffs, but went 47–35. They faced the Sacramento Kings again, and lost in a five-game first round series, 4–1. After the season, the end of an era came as Stockton retired, and Malone left as a free agent to join the Los Angeles Lakers. With their two franchise lead players Malone and Stockton gone, the team lacked foundation as it went into the 2003–04 season. They were expected to finish near the bottom of the NBA by several NBA preview magazines, including Sports Illustrated. The Jazz finished with a 42–40 record. The team featured several unheralded players who emerged as key contributors, including Kirilenko, Raja Bell, and Carlos Arroyo. In particular, Kirilenko demonstrated versatility on both offense and defense and earned a spot in the All-Star Game. The Jazz missed the playoffs by one game to the Denver Nuggets, ending a streak of 20 consecutive seasons in the playoffs. Jerry Sloan finished second in the voting for the NBA Coach of the Year Award, losing to Hubie Brown of the Memphis Grizzlies. During the off-season, the team made moves to change the roster; they acquired Carlos Boozer and Mehmet Okur as free agents and re-signed Carlos Arroyo and Gordan Giricek to extensions. The 2004–05 season was marked by injuries, first to Arroyo and Raúl López, and later to Boozer and Kirilenko, which were a large part of the team's fall to the bottom of the division. When healthy, Boozer averaged 17.8 points and 9.0 rebounds in 51 games. The Jazz ended the 2004–05 season 26–56, their worst since the 1981–82 season. In summer 2005, the Jazz continued to change their roster by trading three draft picks to acquire the number 3 overall pick, which they used to select Deron Williams. Other transactions included Raja Bell leaving the team for the Phoenix Suns, the Jazz re-obtaining center Greg Ostertag from the Sacramento Kings, and oft-injured Raúl López being traded to the Memphis Grizzlies. The 2005–06 season was injury-plagued before it started; Boozer missed the first 49 games and Gordan Giricek and Kirilenko both missed significant time due to injuries. Okur and Kirilenko, however, showed consistently good play, while Williams, despite a mid-season slump, did not disappoint. [according to whom?] However, team owner Larry Miller expressed displeasure with the team's effort during the season. The Jazz stayed in the playoff race until the third-to-last game, when they lost to the Dallas Mavericks. The Jazz ended the season 41–41, three games out of the playoffs. Ostertag retired at the end of the season, having spent 10 of his 11 NBA seasons with the Jazz. In the 2006 NBA draft, the Jazz selected Ronnie Brewer in the first round and in the second round selected Dee Brown and Paul Millsap. Several young players were traded to the Golden State Warriors for Derek Fisher, which give the Jazz frontcourt a veteran point guard. The Jazz were heralded by several major sports websites for drafting well and making good off-season moves. During the 2006–07 season, the Jazz improved considerably compared to the previous few seasons, finishing with a 51–31 record. Boozer was selected as an All-Star for the first time (though he missed the game due to a minor injury) and center Mehmet Okur was selected to the All-Star game as well. Deron Williams finished third in the league in assists per game with 9.3 (behind Steve Nash and Chris Paul). The team also developed a deep bench; in the 10 games that Boozer and Okur (the two leading scorers) missed, the team went 8–2. Millsap was a surprise rookie,[according to whom?] becoming a competent backup to Boozer. Despite the elevated play of the Jazz, Kirilenko had a significant drop in his statistics and seemed to struggle adapting to a reduced role, which eventually led to a well-publicized breakdown early in the first round of the playoffs. The Jazz faced the Houston Rockets in the first round, a match-up of number 4 and number 5 seeds (Utah was seeded higher due to winning the Northwest Division, but Houston had a 52–30 record opposed to Utah's 51–31, giving them home court advantage in the series). It was a physical, close-fought match-up, with each of the first six games being won by the home team. The Jazz broke this trend in the seventh game, and beat the Rockets 103–99 in Houston. The Jazz went on to face the eighth-seeded Golden State Warriors, who were coming off a historic upset of the number 1-seeded Dallas Mavericks. However, the Jazz easily handled the Warriors, and won the series 4–1. The Jazz then faced the San Antonio Spurs in the Western Conference finals, but lost to the more experienced Spurs, 4 games to 1 in the series. The Spurs eventually won the NBA championship that season by defeating the Cleveland Cavaliers 4 games to 0 in the NBA Finals. During the off-season, the Jazz gained a hometown NBA Development League affiliate in the Utah Flash (based in Orem), which they shared with the Boston Celtics. They selected Morris Almond in the first round, although ultimately they made few lineup changes. The most significant move[according to whom?] was in letting Derek Fisher go. Fisher had become a fan favorite due to his strong play, and also a sympathetic one due to his daughter's well-publicized battle with a rare form of eye cancer. Fisher moved to Los Angeles during the off-season to be closer to better care for his daughter, and later signed with the Los Angeles Lakers. Controversy arose after Kirilenko led his Russian national team to a win in EuroBasket 2007 (the European championship), a tournament in which he was named MVP. After that, Kirilenko posted on a blog that he wished to be traded from the Jazz and would be willing to walk away from his contract. He later reaffirmed this in interviews. However, no trade was made and he remained with the team. During the 2007–08 season, after a trade that sent Gordan Giricek to the Philadelphia 76ers in exchange for Kyle Korver, the Jazz had a record-tying 19-game home winning streak and improved on the road after a rough December. Despite the off-season controversy and trade talk, Kirilenko elevated his play, improving all stats from the previous season, and seemed content with his new role as a defender and a facilitator opposed to a scorer. Boozer again was an All-Star selection, while Williams continued to elevate his play. The Jazz finished the regular season fifth-best in the Western Conference with a 54–28 record. The Jazz sold out 46 of 47 home games (including playoffs) during the year, and possessed a 37–4 home regular season record; that was, however, offset by a sub-par road win-loss record. The Jazz again faced the Houston Rockets in the first round of the playoffs, this time as a number 4 seed (although the Rockets possessed home-court advantage due to a better record). The Jazz took a 2–0 series lead in Houston, but lost the first game in Salt Lake City. After splitting the next two games, the Jazz beat the Rockets 113–91 in game 6, placing them into a second-round match-up with the number 1 seeded Los Angeles Lakers, their first postseason meeting since the 1998 Western Conference finals. Utah lost games 1 and 2 in Los Angeles. However the Jazz held up their great home win record and defeated Los Angeles in Games 3 and 4. The Jazz lost game 5 in Los Angeles and were eliminated in Game 6. The Jazz made no major moves during the off-season. The 2008–09 season was difficult for the Jazz as they struggled with injuries that disrupted team chemistry, and although they were again nearly unstoppable at home, they possessed a poor road record. Utah's top three players all missed significant time due to sickness or injury; Williams missed 13 of the first 15 games, Boozer missed more than half of the season, and Okur missed sporadic time due to both injury and his father's sickness that led him to travel to his native Turkey early in the season. On February 20, 2009, Jazz owner Larry H. Miller died of complications from diabetes. His son, Greg Miller, became the new CEO of the team. The Jazz finished with a 48–34 record, slipping to No. 8 in the competitive Western Conference playoff race, after which they were eliminated by the Los Angeles Lakers for the second year in a row, 4 games to 1. The season was the last for long-time radio and former TV announcer Hot Rod Hundley, who announced his retirement after being with the Jazz for their entire history (35 years). Despite the disappointment, Williams proved to be one of the elite point guards in the league,[according to whom?] averaging 19.4 points and 10.8 assists per game, second in the league, despite playing the entire season with a lingering ankle injury. During the 2009 NBA draft, the Jazz selected Eric Maynor No. 20 overall to back up Williams. Veteran Matt Harpring retired, citing consistent injuries sustained from his physical playing style. Rumors circulated that Boozer wanted a trade, fueled by rumors that the Jazz were shopping him after he chose to opt into the last year of his contract; however, the team stated publicly that they did not seek to trade him. Boozer remained with the team heading into the 2009–10 season. The Jazz also added rookie Wesley Matthews to the lineup after an impressive training camp. As the 2009–10 season began they started 19–17. Several trades were made by the team, one that sent Maynor and the contract of the retired Harpring to the Oklahoma City Thunder and another that sent starter Ronnie Brewer to the Memphis Grizzlies at mid-season, a trade which was openly criticized by Williams. The Brewer trade cleared the way for Matthews to take over his starter spot. Also, Williams was selected to play in the All-Star Game for the first time, and after a controversial off-season, Boozer played better than the year prior, averaging 19.5 points and 11.2 rebounds per game, and missed only four games to injury. He suggested that he would be happy to stay with Utah long-term. After returning from an early-season injury, Kyle Korver set the NBA record for three-point field goal percentage in a season. In a tight Western Conference, the Jazz finished 53–29 and lost the division in a tiebreaker with the Denver Nuggets, ending with the No. 5 seed, matched up with the Nuggets in the first round of the playoffs. Kirilenko, who had missed 13 of the last 15 games of the season due to an injury, re-aggravated the injury the day before the first game of the playoffs and missed the first round, while Okur tore his Achilles tendon in the first game and missed the rest of the playoffs. Despite the injuries, the Jazz played well enough to defeat Denver 4–2 in the series. The Jazz were then eliminated by the Los Angeles Lakers for the third year in a row, being swept 4–0 (the first four-game sweep in Jazz history). In the 2010 NBA draft, the Utah Jazz selected Gordon Hayward from Butler University with the No. 9 overall pick, and Jeremy Evans with the No. 55 overall pick. Boozer agreed to a five-year, $80 million contract with the Chicago Bulls in free agency on July 7, 2010. The Jazz turned the transaction into a sign-and-trade one day later, receiving a trade exception worth around $13 million in return from Chicago. Kyle Korver also agreed to sign with the Bulls, two days later. Terms were not announced, but multiple reports had his deal as three years, $13 million. Wesley Matthews signed a five-year, $33 million offer sheet with the Portland Trail Blazers on July 10, 2010. Less than a week after the Boozer loss, the Jazz traded Kosta Koufos and two future first-round picks to Minnesota for Al Jefferson, using the trade exception from the Boozer deal to receive Jefferson's contract without exceeding the salary cap. Raja Bell was added also, to provide backcourt help after the losses of Korver and Matthews. He was signed to a three-year, $10 million contract. On June 15, 2010, the Jazz unveiled a new color scheme and logo, which represented a return to the old 'music note' logo. The team unveiled new uniforms on August 16. The Jazz tendered restricted free-agent center Kyrylo Fesenko a $1 million qualifying offer in June 2010. The offer entitled Utah to match any offer that Fesenko accepted from another team, whether signed or not. Fesenko signed the offer on September 27, 2010, the day before training camp began. On the eve of training camp, the Jazz added two more players, Francisco Elson and Earl Watson for the 2010–11 season. The 2010–11 season began on a positive note, as the team went undefeated (8–0) in the preseason, and in mid-January, they were 27–13 and seemed well on their way to another winning season, had that pace continued. However, over the next 14 games, Utah went 4–10. On February 10, 2011, with the team record at 31–23 after a loss to the Chicago Bulls, head coach Jerry Sloan resigned, along with assistant Phil Johnson. Another of Sloan's assistants, Tyrone Corbin, was named the new head coach, while Scott Layden, the other assistant, remained as well. At the time of his departure, Sloan was the longest-tenured coach in the NBA. A week later, the Jazz hired former Jazz player Jeff Hornacek as an assistant coach. On February 23, 2011, the Jazz traded star player Deron Williams to the New Jersey Nets for players Derrick Favors and Devin Harris, as well as two first round draft picks (New Jersey's 2011 and Golden State's conditional 2012). It was rumored that Williams got into a shouting match with head coach Sloan during a game against the Chicago Bulls, which preceded Sloan's resignation and eventually, the Jazz's decision to trade Williams. While Williams was under contract through 2011–12 with a player option worth $17.7 million for 2012–13, Jazz chief executive officer Greg Miller did not believe they would be able to re-sign him. "And while I never saw any indication that he wouldn’t re-sign with us, I never saw any indication he would", said Miller. The remainder of the season saw the Jazz continue to struggle, finishing with a 39–43 record, 11th in the Western Conference, therefore missing the playoffs for the first time since 2006. During the 2011 draft, the Jazz had two top-14 picks (one acquired in the trade that sent Williams to the New Jersey Nets), and used them on Enes Kanter and Alec Burks. Following the end of the 2011 NBA lockout that saw the 2011–12 season shortened to 66 games, the Jazz bid farewell to their two longest-tenured players – Mehmet Okur was traded to the Nets for a future second-round pick, and Andrei Kirilenko, who played in his native Russia during the lockout and whose contract had expired after the 2011 season, decided to stay in Russia for the remainder of the 2011–12 season. They also acquired free agent veterans Josh Howard and Jamaal Tinsley. During the 2012 off-season, the Jazz traded Devin Harris to the Hawks for Marvin Williams. In the 2012 draft, the Jazz selected Kevin Murphy with the No. 47 overall pick. The Jazz signed Mo Williams and Randy Foye, both former Clippers, and re-signed Jeremy Evans and Tinsley during the off-season. Long-time Jazz player C. J. Miles decided to sign with Cleveland. Andrei Kirilenko did not re-sign with the Jazz in the off-season. The Jazz also named Dennis Lindsey as general manager and Kevin O'Connor as vice president of basketball operations. Longtime assistant coach Scott Layden left Utah to be a part of the San Antonio Spurs front office. Before the 2013–14 season began, Utah did not retain either Paul Millsap or Al Jefferson. Millsap accepted a two-year offer to join the Atlanta Hawks, while Jefferson signed with the Charlotte Bobcats. Jeff Hornacek was hired during the off-season as head coach of the Phoenix Suns. On March 14, 2014, the Jazz were officially eliminated from playoff contention with a 96–87 loss to the Los Angeles Clippers. On June 27, 2013, Rudy Gobert was selected with the 27th overall pick in the 2013 NBA draft by the Denver Nuggets. He was later traded on draft night to the Utah Jazz. On July 6, he signed his rookie scale contract with the Jazz and joined them for the 2013 NBA Summer League. On May 20, 2014, the Jazz earned the 5th pick in the 2014 NBA draft at the NBA Draft Lottery, with which they chose 18-year-old Australian point guard Dante Exum. They also had the 23rd pick from a trade with the Golden State Warriors and their own pick in the second round (the 35th pick overall). With the 23rd pick they selected Rodney Hood from Duke University. The 35th pick was used to select Jarnell Stokes, who was subsequently traded to the Memphis Grizzlies for a future second-round pick. On June 6, 2014, Atlanta Hawks assistant coach Quin Snyder was named the eighth head coach in team history. Snyder signed a three-year contract with a team option for a fourth. He replaced Tyrone Corbin. Prior to joining the Utah Jazz, Snyder previously served as an NBA assistant coach for the Atlanta Hawks, Los Angeles Clippers, Philadelphia 76ers, and Los Angeles Lakers. The Jazz ended the 2015–16 season with a win-loss record of 40–42, good for ninth place in the Western Conference; however, the team failed to qualify to play in the NBA Playoffs by one game. The Jazz finished 51–31 during the 2016–17 season and qualified to play in the NBA Playoffs as the Western Conference's fifth seed. They defeated the Los Angeles Clippers in seven games in the first round for the team's first playoff series win since 2010. The team advanced to play the defending Western Conference champion Golden State Warriors in the conference semifinals where they were swept 4–0, ending their season. Gordon Hayward and Rudy Gobert had breakout seasons in 2017. After putting together several solid seasons in prior years, Hayward was named an NBA All-Star, while Gobert was named to the NBA Defensive First Team and All NBA Second Team. Hayward left the Jazz to sign with the Boston Celtics as a free agent on July 4, 2017, announcing his decision in a letter published by The Players' Tribune. Hayward's contract was finalized on July 14, 2017. On June 22, 2017, Donovan Mitchell was selected with the 13th overall pick in the 2017 NBA draft by the Denver Nuggets, who immediately traded Mitchell's rights to the Jazz in exchange for Trey Lyles. The Jazz also acquired veteran Ricky Rubio to run the point guard position. The Jazz began the 2017–18 season poorly, with an injury to Gobert and a lack of scoring leaving them with a 17–21 record by the end of December. In the second half of the season, the Jazz made rookie Mitchell as starter, who led the team and all rookies in the league in points scored. Mitchell went on to break the record for the most three-pointers ever by a rookie. The team to improved drastically as a scoring team, and with the return of Gobert and improved play of Rubio, the Jazz went 32–13 to close the season and finished with a 48–34 record. The late season burst earned the Jazz a no. 5 seed in the 2018 NBA Playoffs, where they went on to beat the Oklahoma City Thunder 4–2 in the First Round before losing in the Second Round to the Houston Rockets in five games. After the season for the Jazz, Rudy Gobert was named NBA Defensive Player of the Year, Donovan Mitchell was runner-up Rookie of the Year, Quin Snyder was runner-up Coach of the Year, and General Manager Dennis Lindsey was runner-up Executive of the Year. The Jazz have not had a natural or fierce rival throughout their history, where each team has been competitive with the other over a long period of time. There have been several teams that they have played more than once in the NBA playoffs. The Jazz have played the Houston Rockets eight times in the playoffs with the Jazz winning the series five times. The Rockets won two NBA championships in 1994 and 1995), while defeating the Jazz along the way. The Portland Trail Blazers advanced to the 1992 NBA Finals after defeating the Jazz, while the Seattle SuperSonics advanced to the 1996 NBA Finals after defeating the Jazz as well. The San Antonio Spurs won an NBA championship in 2007 after defeating the Jazz in the Conference Finals, while Utah advanced to the 1998 NBA Finals after defeating San Antonio in the Conference Semifinals. Utah advanced to the NBA Finals both times that they defeated the Los Angeles Lakers, while the Lakers have advanced to the Finals each year they defeated Utah in either First Round or Conference Semifinals, winning NBA championships in 1988, 2009, and 2010. During the 2012–13 season, the Jazz and the Lakers competed for the eighth seed in the Western Conference, but the Jazz did not qualify for the 2013 NBA playoffs. The Jazz also have a regional rivalry with the Denver Nuggets. Both clubs are geographically situated in the Rocky Mountains, and have been part of the same division since 1979, having moved to the Northwest Division for the 2004–05 season. The Jazz are the only team in NBA history not to have lost 60 or more games in a season. This distinction was achieved when the New York Knicks and the Los Angeles Lakers both lost more than 60 games in the 2014–15 season. Jazz Bear is the club's mascot. He was introduced to the league on November 4, 1994. Primary logo, used while the team was located in New Orleans (1974–1979). Since the team's move from New Orleans to Salt Lake City in 1979, the Utah Jazz have worn several uniforms throughout their franchise history. From 1979 to 1996, the Jazz' home uniforms consisted of the logo (the word "Jazz" with the J represented as a musical note combined with a basketball) on the center chest, with purple numbers. The only modification to this uniform was the word "Utah" being added to the center chest logo before the 1986–87 season. The road uniforms were purple with the 'J-note' logo and numbers in white. From 1981–84, the Jazz' road uniforms were dark green, with the aforementioned Jazz logo on the center chest and gold numbers. For the 1984–85 season, the road uniforms were changed back to purple, this time with gold numbers and white trim, along with the addition of the word 'Utah' on the logo. These uniforms were worn until the 1995–96 season. 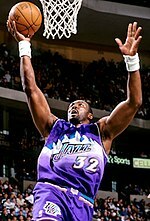 For the 1996–97 season, the Jazz drastically updated their logos and uniforms, with a new color scheme of purple (slightly lighter from the previous shade), copper and turquoise. Their new uniform set featured a silhouette of the Wasatch Range on the center chest, with a stylish new Jazz script, and purple and turquoise details. On the road purple jersey, the white mountain range gradually fades to purple just above the numbers, which are white, with copper interior trim and teal outlining. On the home white jersey, the numbers are purple, with white interior trim and teal outlining. The Jazz wore these jerseys until the 2003–04 season. The Jazz also introduced an alternate black jersey in the 1998–99 season, with the Jazz script on the center chest, but without the Wasatch Range silhouette. On this jersey, both the Jazz script and numbers are white, with purple interior trim and copper outlining, and copper side panels. These jerseys were worn until the 2003–04 season. In the 2004–05 season, the Jazz once again updated their color scheme, logos and uniforms. The new color scheme, which the team used until the end of the 2009–10 season, consisted of navy blue, powder blue, silver and purple, though the latter color was only used on the primary logo and alternate logo. The team logo remained substantially the same, with the exception of the new color variation. The new home uniform consisted of an updated "Jazz" script on the center chest in navy blue, with navy numbers, both of which had silver interior trim and powder blue outlining. The new road uniform was navy blue, with a "Utah" script in powder blue on the center chest and powder blue numbers, both of which had silver outlining and white interior trim. In the 2006–07 season, the Jazz introduced a new alternate powder blue uniform. This uniform, which the team used until the end of the 2009–10 season, featured a Jazz script identical to the team logo and navy blue numbers below the script, also with silver and white trim. The nameplate on the back of the jersey was navy blue. The team's former primary logo, 2010–2016. On June 15, 2010, the Jazz unveiled a new logo and color scheme on the team's official website. For the 2010–11 season, the Jazz reverted to the team's original music note logo (without the word Utah), with a new color scheme of navy blue, gold, dark green & gray. The new uniform set, which was unveiled on August 16, 2010, features a design nearly identical to the team's aforementioned 1984–96 uniform designs, with the following differences: navy blue replacing purple on the road uniform, dark green numerals on the home white jerseys, a white Jazz logo script on the road jerseys and side panels on both the home and away jerseys. The new uniforms were a combination of both the old and new styles, with navy blue retained from the most recent color scheme, but the now-famous 'J-note' logo and gold and green were revived. The team's script logo, 2010–2016. The Jazz unveiled an alternate jersey on December 9, 2011, that is similar to their road jersey, but swaps the navy and green colors so that the primary color is green, with a navy stripe on the side. On May 12, 2016, the Utah Jazz unveiled a refreshed brand identity. The new brand identity includes a new logo system, with some uniform modifications, a new home court design, and the selection of the team's wordmark logo as its new primary logo. In 2017, as part of the switch to Nike as the NBA's uniform provider, the Jazz made some slight changes to their uniform set. While the white "Association" and navy "Icon" uniforms remained mostly intact, the Jazz retired their green and navy sleeved alternates in favor of a gold "Statement" uniform, featuring the navy 'J-note' logo and green numbers. The "City" uniform was inspired from the red rock formations found in Southern Utah, and it featured a gradient of gold, orange, burgundy and black. The Jazz have worn the original J-note uniforms on three separate occasions. During the 2003–04 season, the Jazz commemorated the team's 25th season in Utah by donning replicas of the 1986–96 white uniforms. Then in the 2009–10 season, the Jazz wore the 1981–84 green uniforms (albeit with white trim and letters) to pay tribute to the 30th anniversary of the aforementioned move to Utah. The Jazz hold the draft rights to the following unsigned draft picks who have been playing outside the NBA. A drafted player, either an international draftee or a college draftee, who is not signed by the team that drafted him, is allowed to sign with any non-NBA teams. In this case, the team retains the player's draft rights in the NBA until one year after the player's contract with the non-NBA team ends. This list includes draft rights that were acquired from trades with other teams. 1 In total, Bellamy was inducted into the Hall of Fame twice – as player and as a member of the 1960 Olympic team. 2 In total, Stockton was inducted into the Hall of Fame twice – as player and as a member of the 1992 Olympic team. 3 In total, Malone was inducted into the Hall of Fame twice – as player and as a member of the 1992 Olympic team. The Jazz's flagship radio stations are KZNS (1280) "The Zone" and KZNS-FM Fox Sports Radio 97.5. The Jazz signed a new exclusive 12-year agreement with then FSN Utah, (now part of AT&T SportsNet Rocky Mountain) on October 20, 2009, ending the team's broadcasts on KJZZ-TV. ^ a b c "All Time History". UtahJazz.com. NBA Media Ventures, LLC. Retrieved January 29, 2017. ^ "NBA.com/Stats–Utah Jazz seasons". Stats.NBA.com. NBA Media Ventures, LLC. October 17, 2015. Retrieved October 17, 2015. ^ a b "Utah Jazz Modify Look of Uniforms, Court, Logo". UtahJazz.com. NBA Media Ventures, LLC. May 12, 2016. Retrieved June 8, 2017. ^ a b c d "History of the Jazz Name and Logo" (PDF). Utah Jazz 2017-18 Media Guide. NBA Properties, Inc. October 14, 2017. Retrieved December 23, 2017. ^ "Utah Jazz Reproduction and Usage Guideline Sheet". NBA Properties, Inc. Retrieved August 10, 2016. ^ "Utah Jazz and Qualtrics Partner To Revolutionize Fan Experience and Analytics and Accelerate Efforts to Eradicate Cancer". UtahJazz.com (Press release). NBA Media Ventures, LLC. February 13, 2017. Retrieved December 17, 2017. ^ Sanchez, Matt (February 17, 2016). "Jazz President Rigby Announces Decision to Retire". UtahJazz.com. NBA Media Ventures, LLC. Retrieved July 8, 2016. ^ "Steve Starks Named President of Miller Sports Properties" (Press release). Larry H. Miller Sports & Entertainment. March 18, 2015. Archived from the original on June 22, 2016. Retrieved July 8, 2016. ^ a b Hamilton, Linda (October 29, 2008). "Utah Jazz: Roots of Utah's team planted in New Orleans". Deseret News. Retrieved October 29, 2008. ^ Finney, Peter (October 30, 2002). "Former Jazzman James remembers 1970s NBA hoopla". The Times-Picayune. p. C1. ^ "Jazz Basketball Investors, Inc". FundingUniverse.com. Retrieved April 22, 2007. ^ "Remember the ABA: Utah Stars". Remember the ABA. Retrieved November 25, 2015. ^ Hamilton, Linda (October 29, 2008). "Utah Jazz: Team name still draws snide remarks". deseretnews.com. Deseret News. Archived from the original on February 11, 2018. Retrieved July 7, 2018. He also said that when the Jazz got NBA approval to move to Utah in June 1979, 'We didn't have time to change the name' before the season started. ^ Blackwell, Dave (August 26, 2013). "Utah History Encyclopedia". State of Utah. Retrieved June 2, 2015. ^ "Utah History Encyclopedia – Utah Jazz". Utah Education Network. October 25, 2012. Retrieved June 2, 2015. ^ Blinebury, Fran (September 11, 2009). "Quiet, efficient, tough as nails, Stockton defined the point". NBA.com. NBA Media Ventures, LLC. Retrieved August 17, 2010. ^ Pincus, Eric (February 26, 2013). "How Jerry Buss helped keep the Jazz in Utah". Los Angeles Times. Archived from the original on February 26, 2013. Retrieved February 26, 2013. ^ Robinson, Doug (May 6, 2010). "Late Jazz owner Larry Miller spurned huge payday to keep team in Utah". Deseret News. Retrieved August 20, 2010. ^ "1986–87 NBA Season Summary". Sports Reference LLC. June 2, 2015. Retrieved June 2, 2015. ^ "1987 NBA Western Conference First Round". Sports Reference LLC. June 2, 2015. Retrieved June 2, 2015. ^ "Karl Malone Bio". NBA.com. NBA Media Ventures, LLC. February 21, 1993. Retrieved February 13, 2016. ^ "Jeff Malone NBA & ABA Stats". Basketball-Reference.com. Retrieved January 27, 2013. ^ "David Robinson–Career Stats". Stats.NBA.com. NBA Media Ventures, LLC. June 2, 2015. Retrieved June 2, 2015. ^ a b "Season Review: 1996-97". NBA.com. NBA Media Ventures, LLC. August 24, 2017. Retrieved May 18, 2018. ^ "Jazz lose Stockton 6-8 weeks". The Spokesman-Review. October 15, 1997. Retrieved May 20, 2015. ^ Kurkjian, Tim (October 28, 1997). "CNN/SI NBA Preview '97: Utah Jazz Scouting Report". Sports Illustrated. Archived from the original on January 27, 2001. Retrieved June 2, 2015. ^ www.lakersuniverse.com, Lakers Universe,. "Los Angeles Lakers History: Playoff Performances". www.lakersuniverse.com. ^ "Season Review: 1997-98". NBA.com. NBA Media Ventures, LLC. August 24, 2017. Retrieved May 18, 2018. MVP an MIA in Jazz's latest playoff failure". Deseret News. Retrieved March 19, 2011. ^ "SI's 2003-4 NBA Preview: Utah Jazz". Sports Illustrated. Retrieved August 19, 2010. ^ Stein, Marc (September 21, 2006). "Offseason review: Rating the West from Mavs to Griz". ESPN. Retrieved April 22, 2007. ^ Blinebury, Fran (April 23, 2007). "Kirilenko feels like forgotten man". Houston Chronicle. Retrieved October 13, 2010. ^ "Report: Kirilenko 'ready' to leave NBA, $63 mil contract". ESPN.com. September 21, 2007. Retrieved September 21, 2007. ^ Buckley, Tim (February 20, 2010). "Utah Jazz: Deron Williams sad to say goodbye". Deseret Morning News. Retrieved February 20, 2010. ^ Genessy, Jody (February 24, 2010). "Utah Jazz: Boozer wants to stay". Deseret Morning News. Retrieved February 24, 2010. ^ Genessy, Jody (April 15, 2010). "Utah Jazz: Kyle Korver sets NBA record for 3-point accuracy". Deseret Morning News. Retrieved April 15, 2010. ^ Buckley, Tim (July 8, 2010). "Utah Jazz: Carlos Boozer sign-and-trade agreement reached with Bulls". Deseret News. Retrieved August 18, 2010. ^ "Bulls sign guard Kyle Korver". Bulls.com. NBA Media Ventures, LLC. July 13, 2010. Retrieved May 18, 2018. ^ "Minnesota Timberwolves send Al Jefferson to Jazz for Kosta Koufos, draft picks". ESPN. Retrieved August 18, 2010. ^ a b "Jazz Unveils New Colors and Additional Logo". UtahJazz.com. NBA Media Ventures, LLC. June 15, 2010. Retrieved May 12, 2016. ^ "Jazz Re-Signs Kyrylo Fesenko". UtahJazz.com. NBA Media Ventures, LLC. September 27, 2010. Retrieved September 28, 2010. ^ Smith, Brian (February 23, 2011). "D-Will gets a new jersey — New Jersey's". The Salt Lake Tribune. Archived from the original on February 24, 2011. Retrieved February 24, 2011. ^ Aldridge, David (February 23, 2011). "Utah owner: No hard feelings, D-Will". NBA.com. NBA Media Ventures, LLC. Archived from the original on February 25, 2011. Retrieved February 25, 2011. ^ Jody Genessy. "Utah Jazz: Jazz to trade Devin Harris to the Hawks for Marvin Williams". Deseret News. Retrieved January 27, 2013. ^ Windhorst, Brian (July 5, 2013). "Sources: Paul Millsap, Hawks agree". ESPN. Retrieved October 15, 2013. ^ "HAWKS SIGN FORWARD PAUL MILLSAP". Hawks.com (Press release). NBA Media Ventures, LLC. July 10, 2013. Retrieved October 15, 2013. ^ "Bobcats Sign Free Agent Center Al Jefferson". Bobcats.com. NBA Media Ventures, LLC. June 10, 2013. Retrieved June 10, 2013. ^ "Suns Name Jeff Hornacek As Head Coach". Suns.com. NBA Media Ventures, LLC. May 28, 2013. Retrieved May 28, 2013. ^ "Jazz Acquires Draft Rights to Rudy Gobert from Denver". UtahJazz.com. NBA Media Ventures, LLC. June 27, 2013. Retrieved June 27, 2013. ^ "Jazz Signs First-Round Pick Rudy Gobert". UtahJazz.com. NBA Media Ventures, LLC. July 6, 2013. Retrieved July 6, 2013. ^ "Utah Jazz Names Quin Snyder Head Coach". UtahJazz.com. NBA Media Ventures, LLC. June 6, 2014. Retrieved June 2, 2015. ^ Hayward, Gordon (July 4, 2017). "Thank You, Utah". The Players' Tribune. Retrieved December 28, 2017. ^ Golen, Jimmy (July 14, 2017). "Gordon Hayward signs 4-year, maximum deal with Boston Celtics". NBA.com. NBA Media Ventures, LLC. Associated Press. Retrieved December 28, 2017. ^ Jones, Tony; Falk, Aaron (July 8, 2017). "Chasing Gordon Hayward". The Salt Lake Tribune. Retrieved December 28, 2017. ^ "Donovan Mitchell broke record for most three pointers by a rookie". hoopyhype.com. Hoops Hype. April 10, 2018. Retrieved April 10, 2018. ^ a b "Utah Jazz Franchise Index". Sports Reference LLC. August 13, 2015. Retrieved August 13, 2015. ^ Salvadore, Damon (March 30, 2015). "NBA: Los Angeles Lakers & New York Knicks Hit All-Time Low, But Which Team is Having More Disappointing Season?". Latin Post. Retrieved August 13, 2015. ^ "Utah Jazz Bear" (PDF). 2017–18 Utah Jazz Media Guide. NBA Properties, Inc. October 14, 2017. Retrieved May 18, 2018. ^ Hall, Spencer (May 12, 2010). "New Jazz Colors Revealed". Salt City Hoops. Retrieved January 27, 2013. ^ "2010 Utah Jazz Fan Fest - Unveiling the new uniforms". UtahJazz.com. NBA Media Ventures, LLC. August 11, 2010. Retrieved January 27, 2013. ^ "Utah Jazz to Debut Alternate Third Uniform". UtahJazz.com. NBA Media Ventures, LLC. December 7, 2011. Retrieved June 21, 2015. ^ Creamer, Chris (December 9, 2011). "Utah Jazz Unveil New Jersey; Debuts Dec 30". SportsLogos.net. Retrieved June 21, 2015. ^ "Refreshed Utah Jazz Brand Identity for 2016-17". UtahJazz.com. NBA Media Ventures, LLC. May 12, 2016. Retrieved May 12, 2016. ^ "2017/18 Utah Jazz Nike uniform collection". UtahJazz.com. NBA Media Ventures, LLC. Retrieved November 25, 2017. ^ "Jazz to Celebrate 40 Seasons with Classic Jerseys". UtahJazz.com. NBA Media Ventures, LLC. Retrieved September 28, 2018. ^ "Reaction: Utah Jazz select Nigel Williams-Goss #55". SLCDunk.com. SB-Nation. June 22, 2017. Retrieved April 21, 2018. ^ "FIBA World Cup 2014: Utah Jazz draft pick Ante Tomic, once out of mind, may not be out of sight for long". SLCDunk.com. SB-Nation. August 13, 2013. Retrieved October 2, 2014. ^ a b "Jazz: Players". Sports Reference LLC. May 27, 2012. Retrieved May 27, 2012. ^ "Larry H. Miller Communications Corporation Re-Launches 1280 The Zone". UtahJazz.com (Press release). NBA Media Ventures, LLC. May 23, 2012. Retrieved May 24, 2012. ^ Siler, Ross (October 20, 2009). "Jazz sign 12-year agreement with FSN Utah". The Salt Lake Tribune. Archived from the original on October 22, 2009. Retrieved October 20, 2009. ^ "Utah Jazz Announce 2018-2019 Broadcast Schedule". UtahJazz.com (Press release). NBA Media Ventures, LLC. September 28, 2018. Retrieved October 31, 2018. Wikimedia Commons has media related to Utah Jazz.